This past weekend might have marked the unofficial end of summer, but Summer Fest is still in full swing over here. This week we’re celebrating garlic and it’s perfect timing for me because my friend Ruby recently sent me home with a big bag of garlic from her mom’s garden. I wasn’t sure what to do with all the garlic and I toyed with the idea of roasting a huge batch and perhaps freezing it in small portions to use throughout the fall and winter. But then I remembered the pickled garlic that my grandmother used to buy and serve alongside other appetizers during the holidays. It was really good and I wondered if I could make something similar myself. I found a couple recipes for pickled garlic in my books about pickling and preserving, and it seemed simple enough. The recipes called for either straight vinegar or a mixture of vinegar and wine. I didn’t have any wine in the house, so I decided on a white wine vinegar to use as my liquid. I didn’t use any pickling spices, opting instead for some dried red chiles – I wanted spicy pickled garlic! While searching for information about preserving garlic, I found a link to a UC Davis food safety publication called Garlic: Safe Methods to Store, Preserve, and Enjoy. 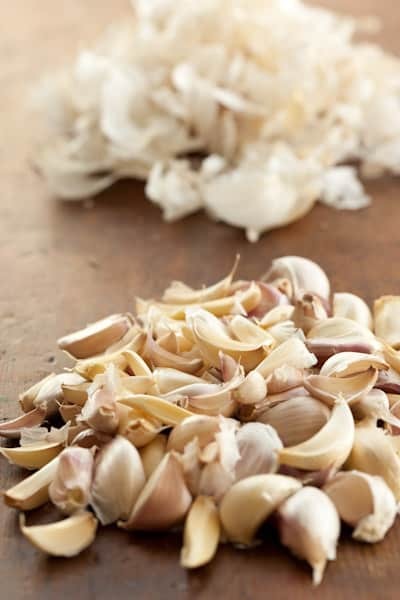 It’s a great resource and it reassured me that I could safely store garlic cloves in wine or vinegar in the refrigerator for a few months. 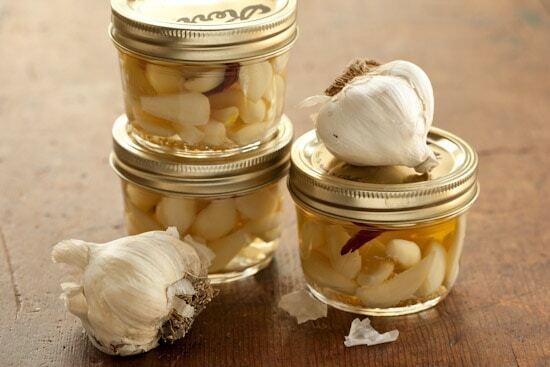 I ended up peeling about five heads of garlic to fill my three half-pint jars with cloves. It took a while! My books said to blanch the cloves in boiling water for 30 seconds to help loosen the skins for peeling. I did that, but I’m not sure that it was any faster than if I had just peeled them dry. I sterilized the jars in the dishwasher then filled them with cloves and put one dried red chile in each jar. I boiled the vinegar with salt and sugar then poured the hot liquid over the garlic and puts the lids on. That was it! I waited for them to cool and then put them in the refrigerator to hang out for the next month or so. I’ll let you know in a month how they taste! Here’s the recipe I used in case you want to give it a try yourself in the meantime. 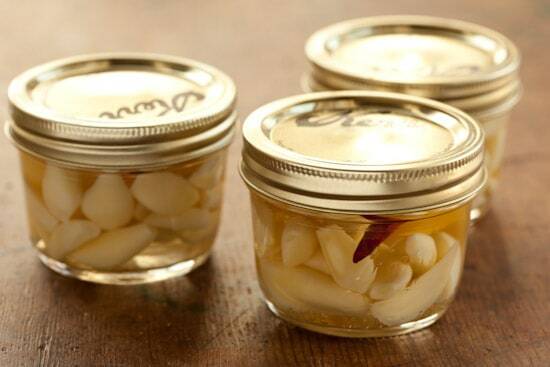 Fill jars with garlic cloves and add one dried chili to each jar. In a small saucepan, combine vinegars, sugar, and salt. Bring to a boil, stirring to dissolve sugar and salt. Fill jars with hot liquid and screw lids onto the jars. Let cool to room temperature then refrigerate. 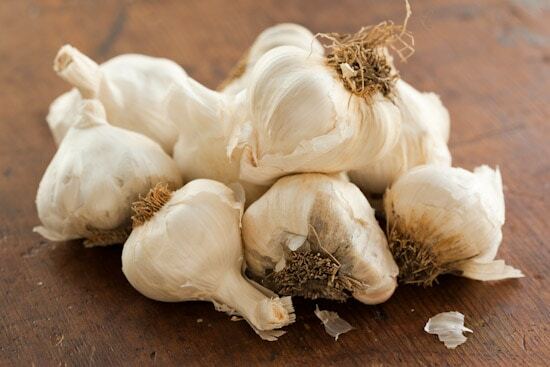 Garlic should be ready to eat in about 3-4 weeks and will keep in the refrigerator for about 4 months. Contribute a whole post, or a comment—whatever you wish. It’s meant to be fun, viral, fluid. No pressure, just delicious. Simply leave your tip or recipe or favorite links in the comments below a Summer/Fall Fest post on my blog, and then go visit my collaborators and do the same. Or think bigger: Publish entire posts of your own, if you wish, and grab the juicy Summer Fest 2010 tomato badge (illustrated by Matt of Matt Bites), or the new pumpkin version he just did if it’s for September 22 onward. I have a whole mess of garlic in the pantry waiting for me to do just this. My husband and two older boys *love* spicy pickled garlic. Hmm....something to try!?! Looks delicious! Love the photos. I've never tried pickled garlic, but it sounds interesting. What do you eat it with? This week I made garlic soup with poached eggs: http://4seasonsoffood.blogspot.com/2010/09/garlic-soup-with-poached-eggs.html So glad summer fest is still on! Gorgeous as always! Would you pretty please post it to Punk Domestics? You're a love! I love pickled garlic and this looks like a great approach. No need to process the jars? Another great condiment to add to my refrigerator!! Great info. on garlic preservation as well!! Caron, if you wanted to store the jars at room temp. then processing the jars would be in order but heating the garlic to that temp destroys some of the flavor which is why it generally isn't done non commercially. Storing in vinegar in the refrigerator is not such a problem because vinegar is acidic and isn't a low oxygen environment. Problem with storing in oil is that it is a low oxygen/ low acid environment which bacteria love.So glad garlic was featured this week - my contribution is a Caramelized Garlic PilafCan't wait to see what everyone else comes up with! Mmmm--I grew up in Spain, and we used to eat pickled garlic as an appetizer. Let us know how they turn out! I'd love to make this. I love pickled garlic! Looks easy and I love the cute little jars. You can also plant your garlic in the fall and then pick it come July. I plan on doing that with some organic garlic from the farmer's market (I think the stuff from the store gets treated so it won't germinate). Una bellissima idea!!!!! A presto!!!! And I JUST bought a jar of pickled garlic from the farmers market for my parents. They look awesome and I hope they turn out good! Saw this on FB and was totally intrigued. Man I less than love peeling garlic, but will do it every time to end up with something heavenly. This looks like it would be. 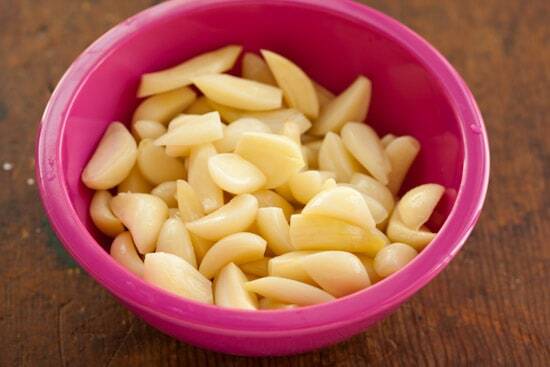 I love pickling garlic but I don't eat it myself. I make it for the rest of the family. Pickling does some great things to the garlic - they kind of end up crunchy in a squeaky sort of way. Pickling also takes some of the 'stink' out of fresh garlic so that even people who don't like garlic can eat it happily. I'm bad sometimes and add a whole bunch of fresh chilies too and some salt to bring out the flavour. Probably not a good idea for those on low-sodium diets. I've never had whole garlic pickled... The minced garlic I had was in vinegar though and it gives it a slightly different taste! I'd have been tempted to roast it along side a chicken and eat garlic with hot roast chicken. Friend was discussing with me recently about jars and how they found it hard to get the new lids these days... I just recycle old jam jars - we seem to use an inordinate amount of jam here! Thank you for including the link to the UC Davis garlic info! I made garlic steeped in olive oil a few years ago and it was delicious, but apparently I was at risk of botulism poisoning! Good to know for the future. Might have to try it in vinegar instead. Hello--just curious, how did the pickled garlic turn out? I searched your site but didn't see a follow up. Are there any changes to the original recipe that you'd recommend? Thanks! Hi there, I was just wondering instead of the white wine vinegar could you just use pickling vinegar. Really nice pictures. 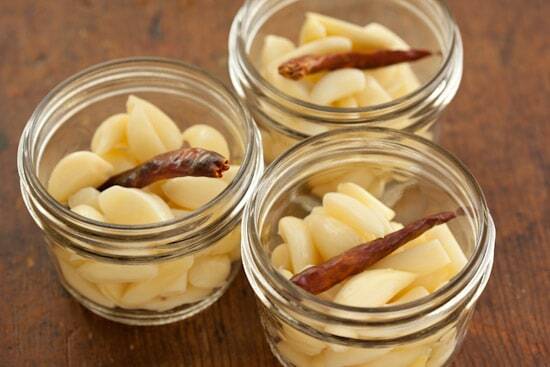 Pickled garlic is my favourite, it can be fantastic with this spicy chili. Found your post hunting around for ideas to hurry along an old favourite. As for your recipe: Gorgeous photos and love the added peppers for flavour and beauty.But... I learned how to pickle garlic from my partners Persian mother some 25 years ago. She merely peeled garlic (by the boat load!!) and filled gallon jars full of them and poured them full to the top with red wine vinegar and put them away in a cool dark place.... FOR YEARS!! I recently stole into a jar a bit early (about 5 years) and though lovely they were not complete. Never heard of a botulism problem (and I was versed greatly in these issues as a child while helping my own mother can and preserve). The garlic preserved this way will turn a lovely deep brown and become sweet as you can imagine, and the vinegar is divine!! 7 years is the usual waiting time so you can see why I was hunting down a more hurried recipe, hoping if maybe heating the vinegar or vinegar with the garlic would produce faster results. I don't believe the same result would come from storing this in a refrigerator sadly. A favourite way of eating it is merely cooked basmati rice fried with olive oil and saffron, served over crumbled feta cheese with the garlic on the side.... HEAVEN!Would really love an update to how yours turned out... I know from time to time she's used white wine vinegar to pickle but never has quite the same depth of flavour to me. A super fast way to peel garlic is to put an entire head of garlic into a mason jar, put the cover on, and shake it very hard for about 30-45 seconds. All the cloves will be separated and peeled.Give it a try, you'll be amazed. Hey there,I'm quite new to cooking and I never really pickled anything. Lately I ate in a restaurant garlic pickled with white wine and dried chili, and now I'm trying to do it myself at home (sadly, I don't have the recipe).Is it ok to pickle the garlic with dry white wine alone (without any vinegar)? If it's possible do I need to cook the wine? how is it different from doing it with vinegar?Thanks! I have pickled some garlic for the first time is it ok if it has turned light green?